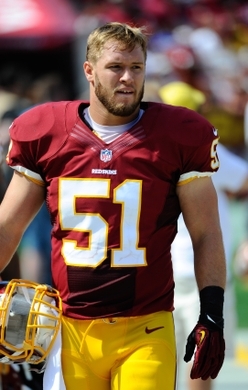 Washington Redskins linebacker Will Compton showed up at the North County Intermediate School on April 10 to talk to the students about pursuing their dreams just as he did. Compton started out his visited there by dressing up as the county’s mascot, Rowdy Raider, and participated in a dance session with the cheerleaders that got the student body energetic and roaring. Afterwards, the Redskin player took off the top part of his costume and delivered a fun and enthusiastic talk to the student body and encouraged them to find routines that they could use to accomplish their goals in the future. The Missouri-born athlete has wanted to be a player in the NFL since he was a child himself and he held on to that dream until he actually made it to the big league through a lot of different obstacles. In 2013 he was signed on to the Redskins as a free agent, and got to play his debut game against the Arizona Cardinals that October. During the off-season and his down time he returns home to Desloge and works in a local clothing store and visits with his mother and brothers. Compton really enjoyed getting a chance to give back to the community as he has been quoted as saying that it is one of the best things that comes with fame. He is a great role model for all the students that he spoke to and he gave them a speech and dance in their mascot suit that they will remember for years to come. If your company is interested in finding out availability and booking fees for a professional football star like Will Compton or other sports celebrities for a Keynote Speech, Autograph Signing, Personal Appearance, or Football Camp, call us at 1-888-246-7141.